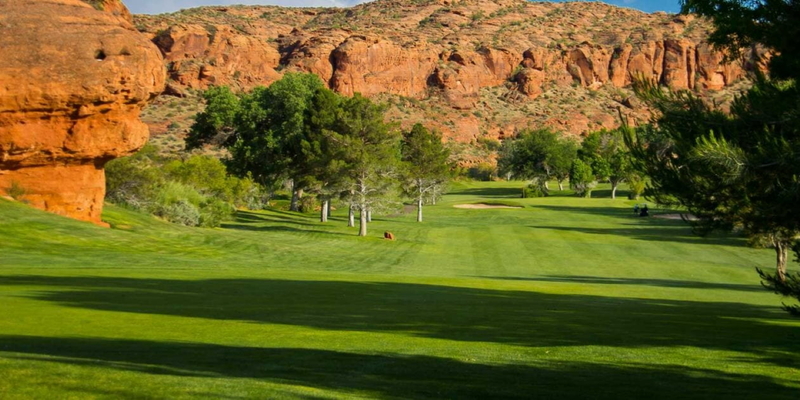 Dixie Red Hills was the first golf course developed by the City of St. George. 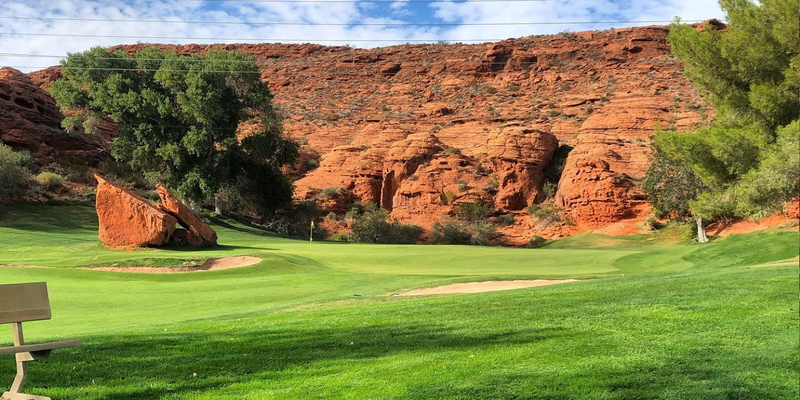 Red Hills opened for play in the mid-1960s and, because of its spectacular red rock setting and playability, has been the favorite of recreational golfers ever since. 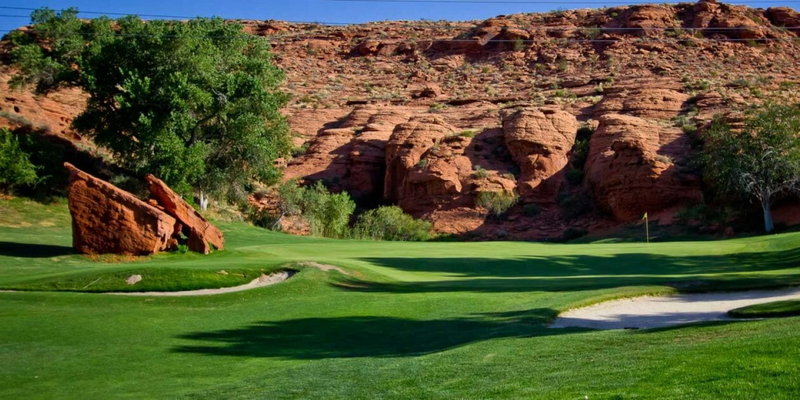 Red Hills is a 9-hole par-34 layout that meanders around the sandstone cliffs of "Utah's Dixie." This golfer-friendly course also features hundreds of mature Cottonwoods, Mondale Pines, Mesquite, and other trees that provide ample shade during St. George's warmer months. Each hole is quite distinct and will leave a lasting memory in the minds of golfers. Three holes that will stand out most are #1, #3, and #6. The first hole at Red Hills is a short, up-hill par four. From the tee it appears quite innocuous. But if you are lucky enough to get past the huge red rock sentry located in the fairway adjacent to the green, your worries have just begun. The first green features three tiers separated by three-foot slopes just waiting to frustrate even the best of players. The third hole is the only par-five at Red Hills. It is basically a semi-circle around imposing sand stone cliffs. If you could tee off directly toward the green, the hole would be no more than a par three. This hole finishes with a huge two-tiered green bordered on each side by hungry bunkers. Hole number six is the last of Red Hills' three par-three holes. Although less than 150 yards, the forced carry over an inviting crystal-blue lake provides more than enough challenge. This is one of the most picturesque holes in the region. Golfers often talk about being addicted to the game. once you play Dixie Red Hills, you to will understand the game's allure! Please call 435-634-5852 for current rates. Call 435-634-5852 for rates and tee times. Contact Dixie Red Hills Golf Course at 435-634-5852 for more information and details on holding a golf outing at the course. Contact Dixie Red Hills Golf Course at 435-634-5852. Contact Dixie Red Hills Golf Course at 435-634-5852 for onsite or nearby dining options. Tremendous value and golf course! This profile was last updated on 02/09/2016 and has been viewed 10,131 times.